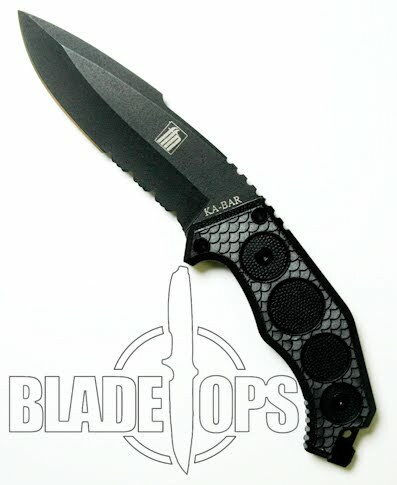 Recently, we added a couple of new KA-BAR knives to our inventory. I know the original style KA-BAR, the fighting knife icon from WWII, is always popular with knife collectors for a wide variety of reasons. It is a good, solid fixed blade knife. I wasn’t quite sure what to expect when we ordered the FIN fixed blade knife. It is a big change as far as style and layout for KA-BAR. When we got these knives into stock, I spent some time with the FIN fixed blade knife and have been very surprised at how comfortable and manageable this knife really is. The bent shape of the handle makes it comfortable to hold. It also makes it feel as if this is a knife that actually extends your reach significantly. As far as most fixed blade combat knives, the straight handle always means you have to bend your wrist slightly to point the knife forward. With the FIN, the slightly bent shape means you can hold your wrist in a more natural position. I like this. As far as using the FIN for a survival type knife it passes with high marks in this arena. The blade is heavy enough to serve you in chopping, cutting, slashing and many other survival needs. And the knife blade is made of D2 steel which means it is durable enough and strong enough to cut without losing it’s edge quickly. This is a great, non-conventional fixed blade knife. KA-BAR did it right with the FIN series.